Using the appropriate boat covers as protection during outdoor storage, trailering or within the winter environment is highly recommended. Without protection, the boat may suffer from discoloration, fading, debris and moisture build up and more. The best boat cover is the Classic Accessories StormPro, which is designed to be heavy duty for maximum protection and comes in a range of sizes to suit all boats. Many people will simply place an old plastic cover over the boat but this is not the correct form of protection. Boat covers must be completely waterproof but allow the boat to breathe so that no moisture is left underneath the cover. 7.1 Why Do You Need Boat Covers? Before purchasing any type of boat cover, it is important that you take the correct measurements. Some covers are also dedicated to certain types of boats and we recommend avoiding universal types as they will require a lot of strapping down. The majority of people will be towing their boat at speeds between 50 to 80 mph and it is vital that the boat covers do not fall off. Most use ratchet tie down straps to secure the boat to the trailer but these can damage covers that use cheap materials. The boat cover material you choose must be heavy duty and not rip easily in order to withstand outdoor storage and trailering. Below is a list of the best boat covers that will ensure the boat is fully protected in the winter and whilst trailering. The Classic Accessories Lunex RS-2 is one of the best boat covers that the brand produce. It is a heavy duty marine grade cover that has been designed for superior protection in storage and high speed travelling whilst being towed. With most cheap boat covers, there is no supporting pole included. However, with the Lunex RS2, there is one included which prevents water building up in the middle of the cover. This also helps preserve the cover against unnecessary damage. Overall, it is the one of the best boat covers with a range of sizes available to fit a whole range of boats. We do recommend going for one size higher for the perfect fit. The Budge 600 Denier Boat Cover is ideal for T-Top/Hard Top boats requiring protection from the harsh winter elements. It is available in two colors (blue or grey) and available in five different sizes (from 14 to 26 feet). Whether you have a T-Top boat or do not want to dismantle your bimini top each time you wish to cover it, the Budge 600 is perfect. It does come at a cost but it has everything you want in a boat cover and ensures all content are kept protected. The MSC Heavy Duty 600D boat cover has 6 sizes to choose from as well as a range of colors. The darker colors are more desirable for the winter weather as it can hide the dirt and debris build up much better. Considering that the whole package comes with a number of added extras, it is by far the best boat cover for the money and has the added benefit of plenty of choice when it comes to the colors and sizes. 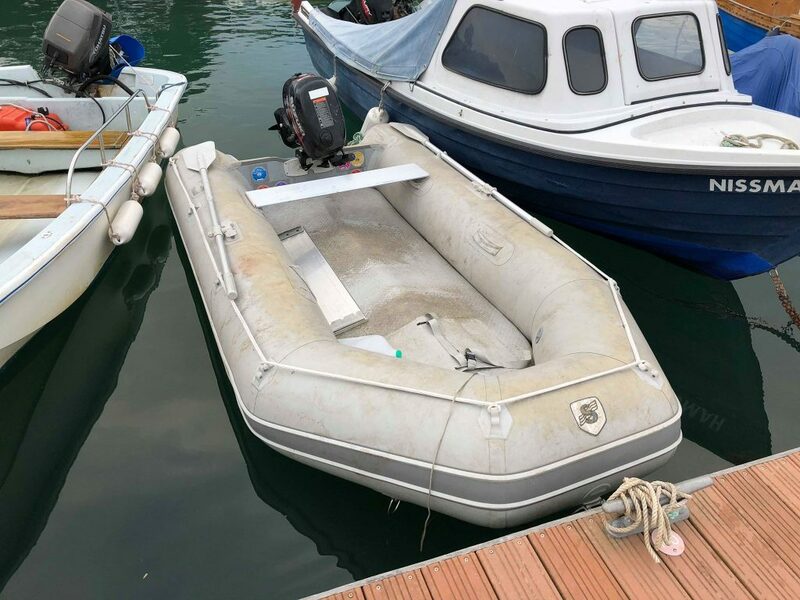 An inflatable dinghy will require a different design to most boats and the Newport Vessels cover is the best option. It uses a heavy duty 600D polyester material that has high UV resistant properties and will ensure your inflatable boat is kept protected. 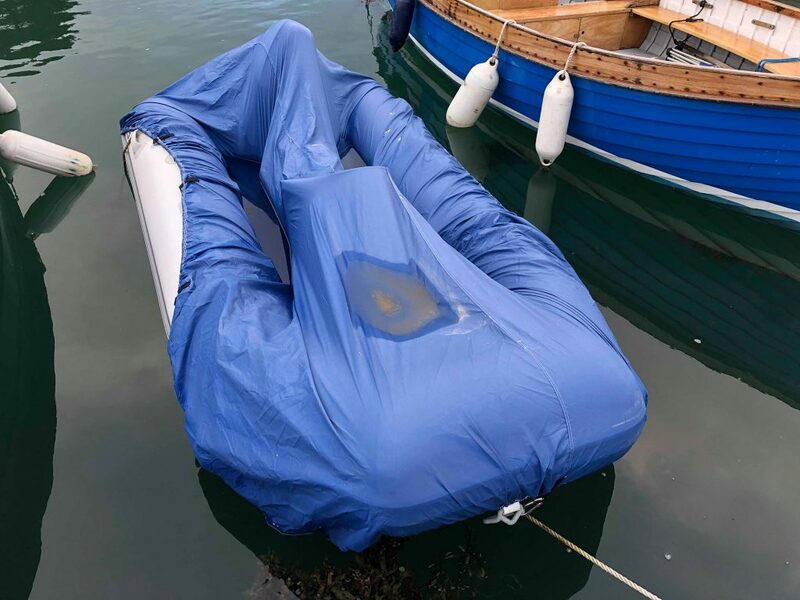 Overall, the Newport Vessels Cover is the best boat cover for small boats and it is designed to fit the majority of inflatable ribs such as Zodiac, Avon, Achilles, West Marine, Saturn, Mercury, AB and more. The Brightent boat cover is available in a range of sizes where all are woven with a 600D polyester material. It is a marine graded PU Coated material that holds impressive water proofing and sun protection properties. Included with this cover is a bag made from the same 600D polyester material, which is ideal for storage. Overall, it is a great boat cover for winter and offers excellent value for money when compared against other heavy duty boat covers. Protecting your boat during outdoor storage in the winter is essential but so many boat owners do not use a winter cover. Many that have fiberglass hulls will use marine wax, which is great but the inside of the boat can become damaged if not covered. For example, you may have some expensive upholstery or brand new marine carpet, which will become damaged by the water, debris and much more. Other benefits to using boat covers as protection during the winter is of course security. If a criminal is looking to steal from your boat, if they cannot see into it, they are not going to take the risk of wasting their time breaking through the cover. 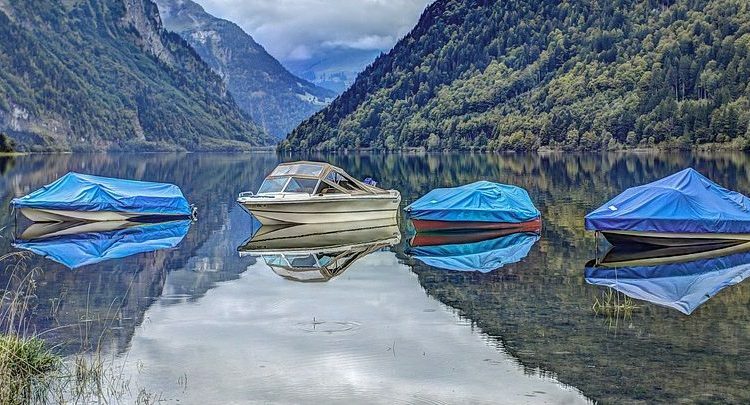 Why Do You Need Boat Covers? The main reason that people should cover their boats, is because certain components can become damaged. The winter months can cause havoc on non-weather proofed items. This short-term damage can lower the value and beauty of the boat if measures aren’t taken to avoid this problem. Below is a prime example of a small boat that was not covered during the winter and as its not fiberglass, you cannot simply use a boat buffer to bring it back to life. The damage to boats can actually happen in the summer too. In the summer when there is large amounts of sunlight., the ultraviolet rays damage your boat and can break down the fiberglass and any component inside the boat. On top of protecting your boat, there is also the factor of repelling water from building up inside your boat. Some will argue that an automatic bilge pump will take care of this and that is true to some extent. However, this will drain your marine battery if its constantly working to remove water from the boat. The cover gives your boat a layer of needed protection to safeguard against damage and depreciation. Ideally your cover needs to be on all year round when in outdoor storage for maximum protection. When in a rush, many boat owners will skip vital steps to correctly covering their boat. Whether this be before storing it outdoors or even trailering, it is bad practice and its vital that you take your time when using boat covers as it can cost you in repair bills. Ensuring that all the straps are connected properly to each latch and that you are using the correct sized boat cover for your boat is critical. Choosing the best boat cover can be through a mixture of factors from size to the price you are willing to pay. 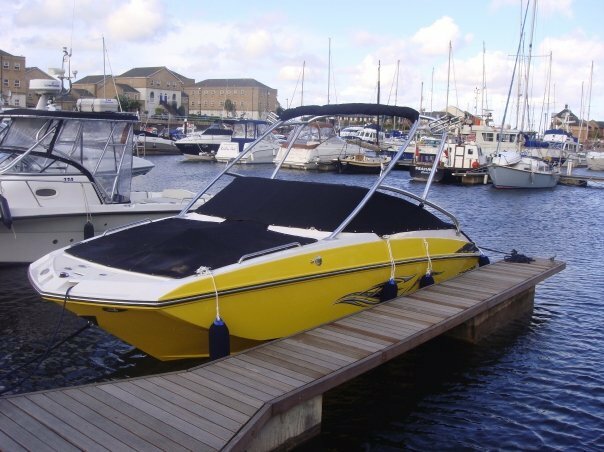 There are many recommended covers for boats that are great but some do not provide adequete protection for the winter season. However, if like myself, you have your boat in a garage (indoors) a heavy duty cover may not even be required. When choosing what type of cover to purchase or build your boat, remember that plastic tarps are less expensive than canvas. The most expensive type of cover is a custom-fitted canvas. Plastic tarps will always breakdown due to the wind and other elements from the weather. Canvas is heavier and can withstand the wind when it blows upon the boat. Canvas tarps can help to avoid sun rot, chafe, and other problems that can happen to the boat. A fitted canvas lasts for a long time and doesn’t flap when it is in the wind. A canvas will cost less on repairs as it can be used multiple times, while the plastic tarp can’t be repaired and thus must be replaced when it is damaged. The lower cost-effective way is shrink wrapping a boat. This process started when companies that manufactured boats started to use plastic materials to protect their inventory while being distributed to other locations. This way of protecting boats was eventually incorporated by others as a service to offer to people who owned boats. Shrink wrap requires specific tools that allow a person to cover their boat, that’s why this service is usually a paid service. Once the plastic wrap has been applied to the boat, it is impossible to use again and must be reapplied to the boat every season. This type of cover doesn’t flap in the wind, doesn’t cause chafe or scratches to wear down the fiberglass. The plastic wrap leaves the boat virtually spotless. The down side to plastic wrap covers is that you will have to replace the cover each season. The best thing about using this sort of covering is that the boat will be as it was left when it was covered. Covering your boat is a good way to ensure that it can be used for future seasons. When covering your boat and storing it, consider air flow throughout the boat to avoid things like mildew. Consider making sure that the boat has adequate air movement while it is covered. Make sure that the ventilators are ready and can move air about the cabin. To maintain the appearance of your boat and prevent avoidable damage, boat covers are the best option. They come in a range of sizes and designs to match the decor of your boat and are generally fairly cheap compared with the maintenance bills you would have when not using one. Taking measurements prior to purchasing is highly recommended and be sure to include your outboard motor when fully tilted within your measurements. All of our recommendations cover a range of different boats and are ideal for outdoor storage, trailering and protection during the winter. I’ve been needing to get a canvas trailer cover for our boat, and I think that having some tips on how to do so would be really helpful for me! You talked about being able to make sure that you don’t do a sloppy job and have all of your hard work rigging up the trailer cover go to waste. I’m going to have to be very careful when we get our cover, and be sure that its properly fixed and secure! Thank you!